In my first post in this blog I mentioned metaphorical hurricanes…those life-changing events that blow through each of our lives forever changing how we see the world. If we’re lucky, we might first hear a whisper…a warning…letting us know something is on the way. If we pay attention, we might be able to change course or make preparations for what’s ahead. When we don’t heed the warnings we are left to batten down the hatches and say a prayer. Anything can happen. When I made reference to hurricanes in that post, I don’t think I was aware that an actual hurricane—Hurricane Sandy—was making its way toward the east coast. As the storm approached, those of us living in her path were all given the opportunity to decide just how we would weather the storm. And as it turns out, quite a number of fateful decisions were made. Martin Luther King Jr. said it best: The ultimate measure of a man is not where he stands in moments of comfort and convenience, but where he stands at times of challenge and controversy. How we react in times of unthinkable hardships truly defines who we are… as individuals…and as a nation. But what does our “storm” preparation say about us? We watched our elected officials very closely. Everything they said and did was viewed through the lens of the upcoming presidential election: FEMA, racism, and global warming were just a few of the super-charged topics on our minds. Was this all a bunch of hype? A conspiracy? Perhaps it could be boiled down to a few simple concepts: fear vs. love, self-responsibility vs. dependency, empathy vs. callousness. Two days before the storm’s arrival, my husband and I attended the memorial service of a friend, Bobby Flemming, a long time volunteer for the Philadelphia Ship Preservation Guild. At Bobby’s request, it was less “service” and more “barbeque & beers” …dubbed the Bobbyque…and as she had envisioned it, an occasion to bring together the community of people she loved most. 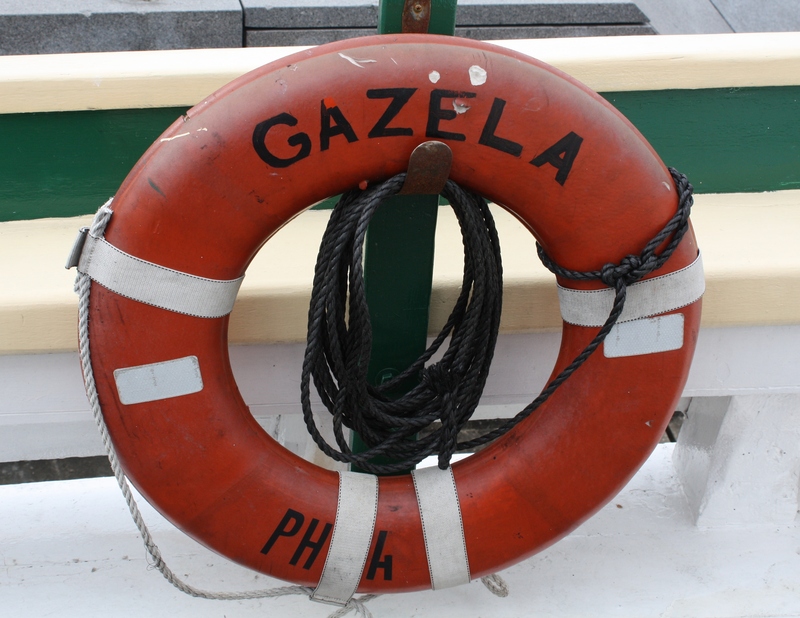 And as we all gathered onboard the tall ship Gazela to honor Bobby’s life and share stories, the youngest crew members were scrambling above our heads in the rigging, preparing the ship for the oncoming storm. It was a gloomy day, warmer than normal, but with a chilly breeze blowing in off the Delaware River. As I am not a seasoned sailor, but merely the wife of one, I was not oblivious to the brewing undercurrent. I don’t have sea-legs…I feel everything. But perhaps psychically there was something more going on. In the course of the afternoon, conversation eventually turned to the HMS Bounty, and the fact that its captain had made the decision to ride out the storm at sea as the ship made its way from New England down to Florida—sailing a course they thought would allow them to navigate outside the storm’s reach. Our friend Ed, who was also in attendance that afternoon, had recently spent six months on the Bounty sailing across the Atlantic. 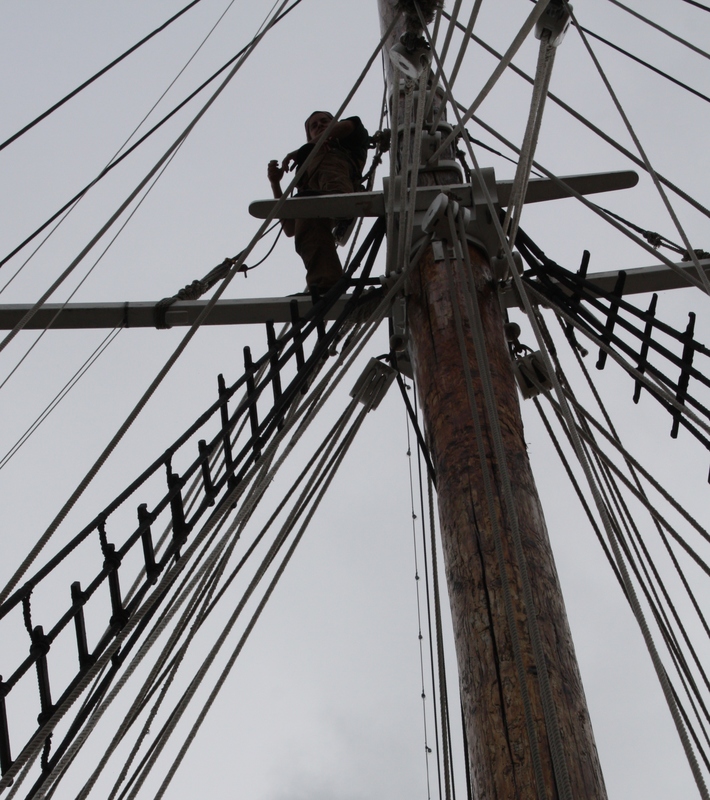 In the relatively small community of tall ship sailors, there were many individuals in attendance that afternoon who had spent time with members of the Bounty crew. There was great concern, but I don’t think anyone doubted that the ship and its crew wouldn’t make it through the storm. Later, at home, I asked my husband what he would have done had he been given the choice to sail on or stay in port. “Promise me,” I said, “promise me that you would get off that damn boat!” Of course I knew his answer, despite the fact he never actually stated it. “Ships are made for sailing,” is what he said. Instead, he reassured me that he’d been trained in what to do if the ship went down…there were special dry suits and life boats…he’d practiced emergency drills in a local pool…the ships have special tracking devices… I wondered to myself how I never knew any of this before that Saturday. I suppose I just hadn’t paid attention. Why was that? Two days later we all watched the US Coast Guard video in disbelief as the HMS Bounty disappeared underwater off the coast of North Carolina and fourteen crew members donning bright orange survival suits were plucked one-by-one out of their specialized lifeboats. It was a breathtaking feat to say the least. The body of one crew member who didn’t make it into the lifeboats would be located right after and the Coast Guard would call off the search for the captain several days later. As we watched the fate of the Bounty unfold, the major cities on the 95 corridor prepared for the worst. We were inundated with nothing but weather updates on all the network television channels 24/7. The storm’s path and ETA were a bit murky, but something now called the Frankenstorm—in honor of Halloween—was on its way. I wondered if the name might be in reference to the fact that it seemed to be a hurricane, but might also be a Nor’easter…but perhaps was something altogether different if you paid attention to the predictions of climate-change scientists. And to complicate things further there was a full moon scheduled during the high-tide which would occur during the height of the storm. Regardless of what exactly it was, we all had plenty of notice that a storm of unknown magnitude was heading straight for us. The barrier islands off the coast of New Jersey were evacuated, along with any other flood-prone zone that might possibly be affected by the predicted storm surge. By Sunday night the major cities were ghost towns, with all transit systems cancelled…no planes, trains, buses or subways… and several major highways were closed. Official word for Monday was…stay home. With the storm inching forward into the Philadelphia region sometime Monday afternoon, there wasn’t much to be done other than wait around for the big event. For some of us that meant making the most of our electronic gadgets until the electricity went out. Facebook became a place to waste time when you got tired of hearing the dire warnings on the television. I was shocked to discover a number of angry posts on my Facebook page. Comments were traded over the fact that our city—Philadelphia—had been closed down too early. One friend was incensed that her children’s school had been cancelled not just on Monday, but for Tuesday and Wednesday as well. Another friend was irate that our city government was closed for the entire day. He decided that we were all a bunch of pussies (his words), worrying about nothing. I was flabbergasted by this response. I wondered why this friend felt so inconvenienced. Was there something he had to accomplish on this particular day? Some specific task that required the assistance of a city office? Something SO important that it couldn’t wait a day or two? What was my friend thinking? Doesn’t a city worker have a right to be home with his/her family in preparation for this storm? And why shouldn’t the city cancel all public transportation? This decision made it easy for companies to follow suit…to tell all their workers to stay home. In my book, unless a life is at stake, nothing is so important that it can’t wait until tomorrow. People are always complaining they don’t have more time to spend with their families…well here was a great opportunity…and they were bitching about it. I just didn’t get it. I also had a difficult time understanding the cynical undertone of those who “made fun” of others’ storm preparations. Emergency plans are developed for a reason, right? Yes, the meteorologists might have over-estimated the magnitude of the storm…they’ve done so before. But what if this time was different? And if we were over-prepared, what’s the worst that could happen? Oh that’s right, you had to stay home from work and you have extra bottled water and canned food in your cabinet. Boo fricken’ hoo. By Tuesday afternoon the worst was over. While most of Philadelphia escaped anything beyond downed trees and intermittent electricity, we were just beginning to learn how lucky we were. Those of us with power watched our televisions in horror as we started to see proof of our neighbors’ devastation. It dawned on me that had my husband and I lost our electricity for more than a day or two, we were woefully unprepared. I’d gathered candles, bottled water, and some cash…but I laughed when I realized we hadn’t done so well with our food selection. Our diet would have come down to peanut butter, bread, apples, and potato chips. Lucky for me I live on a great block. I have no doubt that my neighbors would have come together and organized several great potluck meals. There would have been camp fires in the street and plenty of alcohol. My recent health issues have shown me just how great my neighbors are… I’ve had home-grown vegetables, flowers, and magazines delivered to my front door…my next door neighbor chased down the UPS man knowing that my chemo-meds were due to be delivered on the same morning I was scheduled to be at my doctor’s office, sending me a text when they were safely in his hands… another neighbor told me she had included my name in her church prayer circle. But even with all that neighborly camaraderie, if hurricane Sandy had taken a slightly different path…well, good intentions can only go so far. Sometimes you just need outside help. In the days following the storm even the naysayers had to admit the governmental decisions—federal, state, and local—to “close down” the east coast, saved a lot of lives. And for many of us, the decisions that were made for us…or despite us…meant that we were able to weather the storm rather easily. Those living north of the hurricane’s eye did not fare so well. But even with all of the loss of life and property, that too could have been much worse. Last night at dinner, my husband was telling me about a television show he’d recently watched. One of the families featured had built their home in a bunker and had twenty years worth of canned goods on hand at all times. They were isolated in some remote part of the country and were teaching their children how to hunt and defend themselves with weapons. These people would surely be ready for any catastrophe. It made me think of the promos I’d seen for that other show called Revolution…where the electricity is turned off and our country falls into disrepair… I have not yet watched it. All that post apocalyptic imagery just depresses me. Do I really want to be “prepared” to live in such a world? The other image I have had mulling around my brain is a photo taken by my friend RA Friedman. RA is a talented artist, a photographer, who spends as much time as he is able pounding the pavement capturing amazing images. 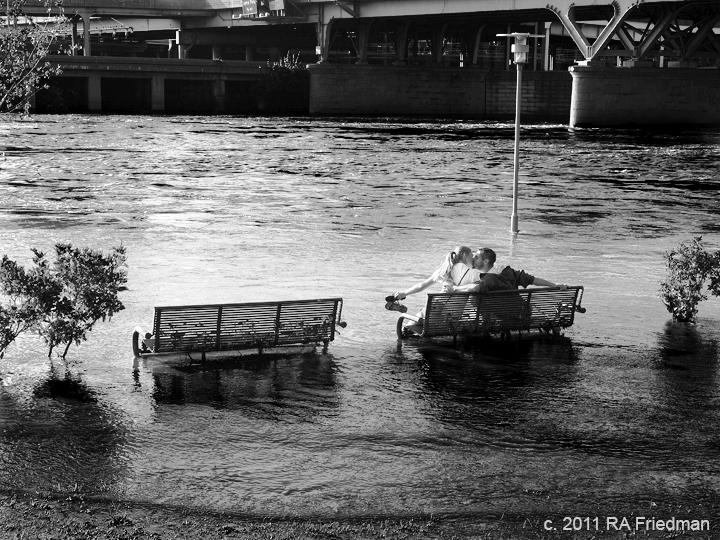 Just after hurricane Irene in 2011, he came across a couple kissing on the flooded Schuylkill River here in Philadelphia. When I can get past the part of me that wants to yell at them for being so stupid for walking through flood waters (for starters I’m looking at the current and their bare feet…), I see two people in love, oblivious to the risks they might be taking. Somewhere between canned-food isolationism and a romantic walk through flood waters, I hope to achieve the perfect balance between fear and love, self-responsibility and dependency, and empathy and callousness. And with any luck, someone will throw me a life-preserver when I need it most.